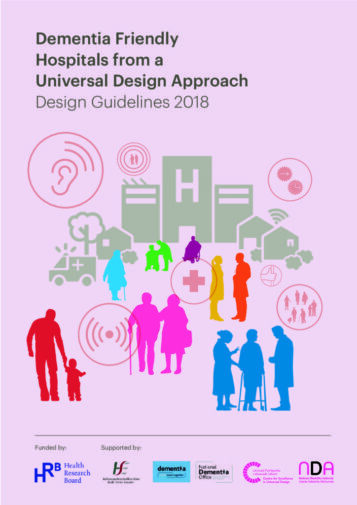 These guidelines provide detailed guidance in relation to dementia related design issues and the Universal Design of acute hospitals in Ireland. It aims to inform national policy and be used in practice by all practitioners – those who commission, design, build, provide and occupy hospitals. The guidelines were completed as part of a research project funded by the Health Research Board (HRB) Applied Research Projects in Dementia 2015 programme, administered by the HRB in collaboration with The Atlantic Philanthropies (AP) and the Department of Health (DoH). Grey, T., Xidous, D., Kennelly, S., Mahon, S., Mannion, V., de Freine, P., Dockrell, D., de Siún, A., Murphy, N., Craddock, G., O’Neill, D. (2018). Dementia Friendly Hospitals from a Universal Design Approach: Design Guidelines. Ireland.